In medium nonstick saucepan, combine cheese and milk; cook over low heat until cheese is melted and smooth, stirring occasionally. Stir in tomatoes; cook 2 to 3 minutes or until thoroughly heated, stirring frequently. Stir in cilantro. Serve over hot cooked pasta. To spice up this sauce a bit more, use hot Mexican pasteurized prepared cheese product. Not a fan of cilantro? Try a combination of chopped fresh parsley and oregano. 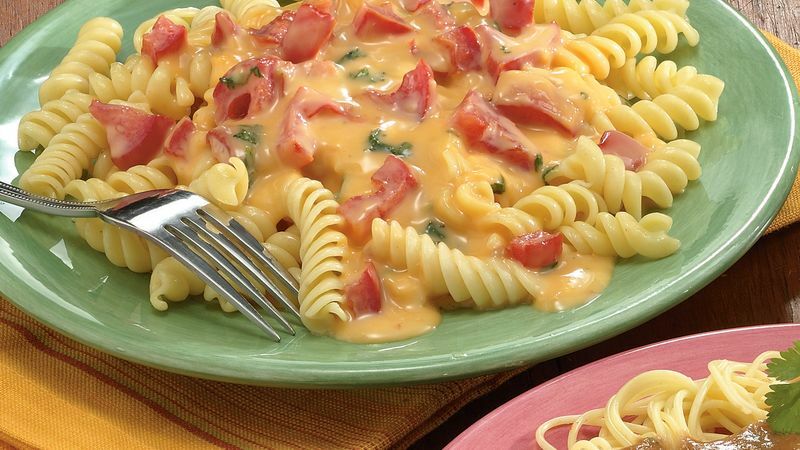 Taco- and nacho-munching kids will love this cheesy sauce over their favorite pasta; try small shells, elbow macaroni, and fun themed shapes.